What a beautiful place for a wedding! California Pines Lodge has everything you need for a beautiful wedding presentation. We have the view, the banquet room, the accomidations for the family, the cocktail lounge and the entertainment room afterwards for the party! Let's get the party started by allowing Caliofnia Pines Lodge to plan your entire wedding event. Our beautiful lake-view banquet room is perfect for your reception meals and prefered guest seating. The resturant is ready to handle you entire wedding party and guest with anything from the basic down-home cooking, to a lavish dinning experience. Accomidations right here on the lake for your entire wedding party. 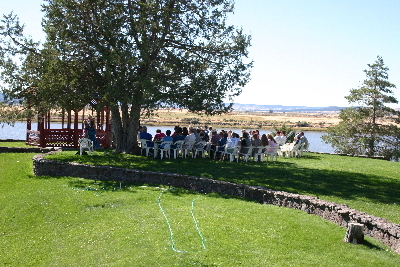 Everyone can enjoy your company before and after your wedding as everyone is staying right here on property for before and after the wonderful day. No need to drive anywhere. Stay inside and play, or go out on the balcony and just watch the wildlife on the lake. The days are never in a hurry at Califonia Pines Lodge. Finish off the afternoon with fun in the activities center and Caliofnia Pines cocktail lounge, complete with pool tables, ping-pong, video games and big screen television. There is plenty of room for your DJ, dancing and reception fun! 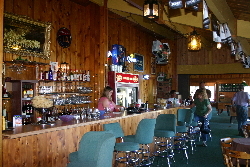 There is so much room to have fun in our entertainment area, you may get lost back there, or slip out to do some fishing and nobody may know you are even gone!